Last week, I took my friend for an unusual birthday treat. A pedicure which didn't have a foot buffer, nail file or pair of toe clippers in sight. 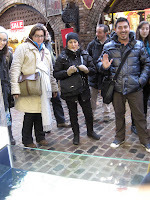 Situated in Camden Market is a 'treat for feet' called Zoola Fish. A tiny outfit (one of two in Camden) hidden amongst the market stalls, with the only piece of equipment being a fresh water tank full of tiny fish. Fish who are hungry for your flesh! It's a walk-in service offering 15 or 30 minute sessions. We opted for 30 mins and the friendly woman in charge gave us a towel, then we literally rolled up our trousers, sat on the side of the tank and immersed our feet - very apprehensively - into the tepid water. I let my friend dip her toes first (well, it was her birthday) so I could photograph her reaction and ascertain whether I should be making a speedy getaway. It definitely involved quite a bit of squealing and nervous laughter, but her toes were still intact which was encouraging enough, so I discarded all my footwear and took the plunge too. 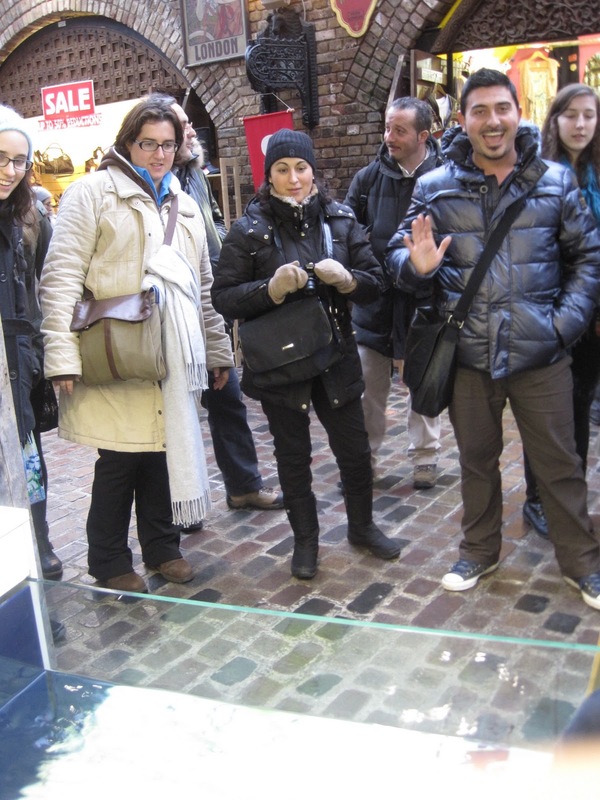 I also let out an initial shriek, much to the amusement of onlookers, as due to the open location of the venue, it does draw a lot of attention from passers-by. 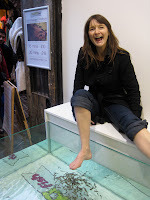 It would seem our fish-engulfed feet are already the highlight of various tourists' holiday snaps! It really is a very strange sensation as a shoal of little fish literally bombard your feet in a frenzied feeding attack and you're convinced it will hurt and just pray that a stray piranha hasn't slipped through the net. But you very quickly get used to it and apart from being a tad ticklish, it soon becomes oddly enjoyable as the fish swim around your feet and in between your toes, sucking and nibbling away all the dead skin. Lovely! A perfect way to spend half an hour having a chinwag with your mate whilst the fish get stuck in. They're more like nippers than clippers, although they don't actually have any teeth. The fish are called Garra Rufa fish, and are also known as Dr Fish because of their healing properties. This particular bunch herald from Turkey. Fish pedicures are becoming increasingly popular all over the UK and I highly recommend it. Zoola Fish are opening branches nationwide and already have one in Tunbridge Wells. 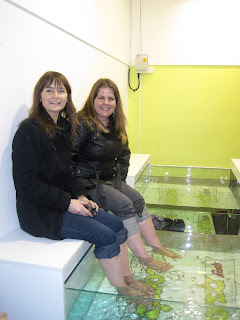 My friend and I both agreed that our feet felt incredibly soft and smooth afterwards, especially the 'sole and eels'. It was very relaxing and quite reasonably priced at eighteen squid for half an hour (or a tuna, sorry tenner for 15 mins). I don't want to carp on much longer, so I suggest you make a trip to Zoola Fish and take your plaice in the tank. Right, that's quite enough fish gags - better stop before I get battered. Oooh! Feel free to leave your own fish puns in the comments area below the post. In fact, I'm running a little competition. Whoever posts the funniest fish-related comment, will win 2 vouchers for a 15 minute session by very kind courtesy of Zoola Fish. The winner will be chosen by the bods at Zoola Fish and the deadline is 12pm next Friday 21st January. I will contact the winner directly and announce them here after the competition closes. So for Cod's sake, get commenting! It is UYEN LUU with her hilarious and simple retort "Pollacks to you Andy Green - I want to win!" Classic. Well done Uyen, your vouchers are on their way. Thanks to everyone who entered - all great comments! I might DAB my little feet into this PLAICE whether I win or not! The LINING of my SOLE could definitely do with some FISH POUTING. I might bring a friend and have a BRILL time CARPing away. When the Dr fish grow up will they become a Sturgeon? They learn how to eat dead skin when they are very young at plaice school. Trawling through the internet, all of a sardine I find this fintastic blog. Nice to perch while fish sort your feet like trained sturgeons. Maybe a Grouper us should go? Wahoo! I’ve been herring a lot about this – people whiting reviews really rayting it. So they get a tank, fillet to the bream with cod water and loach and loach of little fish. Then you perch on a bench and roll up your troutsers. I bet you had bonitos when they’d finished. Am I misthaken or did salmon mention a price to the tuna £18? Looks like you flounder bargain. Definitely looks like a gill thing tough. It’d be a bit odd for a manta do it. Halibut you never know, maybe if I haddoc k-orn on my foot or somefin? And Camden’s only a pike ride away…or I could get the bass from Tottenham caught rudd? I might go tomoray…todace too busy…a bit hewrassed at work. Let minnow if I win. Pollacks to you Andy Green - I want to win! Wrap me in newspaper and put a wooden fork in me – I'm done trying to beat Andy! As the luckiest girl who had the pleasure of sharing this amazing experience with my dear friend Imy, I am well plaiced to say that it really is the strangest and lovliest thing! What more could a girl want! I was whisked to this surprise destination and still able to travel on my oyster card....how brilliant is that! The soles of my feet were nibbled to perfection and my eels were as soft as a tuna's bottom! All this for 18.00 squid, you can't say fairer than that and it was all a wonderful treat from Imy. We even managed to pout to the wall of people watching us enjoy a little piece of heaven. Q. What did the piranha say to the garra rufa? A. Are you done with that? I'm flounder-ing here, trying to think up a brill-iant fish pun! That's it...I've haddock...I give up! If anyone gets those fish near my feet they're going to get battered. I think I may have just won thanks to a new angle on the fish puns. Angle!? Anyone? !